People struggling with addiction are suffering from a spiritual disease. The word disease can literally be broken into the prefix, ‘dis,’ and the root word, ‘ease,’ indicating how discontent alcoholics and addicts feel from years of substance abuse. It is not a natural thing to pour gallons of vodka into our bodies, shoot intravenous drugs, take bottles of opiates until we pass out, and sniff whatever powder we can get our hands on. Drug and alcohol abuse affects our behavioral health to the point where we don’t recognize ourselves anymore. It strips us of our morals, values, and self-identity. The ‘dis’ ‘ease’ we feel creates a spiritual void, a feeling of emptiness in our hearts, and no matter how many gallons of vodka we drink or how much dope we shoot, nothing fills that void. In the first few days of alcohol and drug detox, the physical withdrawal symptoms are tough to endure. But the emotional and mental health symptoms can be pretty tough too. Alcoholics and addicts exhibit self-destructive behavior to such an extreme, it can seem the only hope is through finding a higher power. What Is Faith Based Recovery? Many addicts and alcoholics think they need certain religious beliefs to get sober. Loved ones that belong to a religious denomination may try and impress their views on substance abusers. They’ve stood by and watched them nearly kill themselves for so long, that out of desperation they may try and force their religion on loved ones. It simply doesn’t work. Addicts and alcoholics are rebellious by nature, and if they are to engage in a spiritual rehab program, the desire has to come from within. Usually they’ve gone through so much pain by the time they enter a recovery center, they are more likely to seek a spiritual solution. Faith based rehab programs will help catapult those open-minded to it into a meaningful recovery. Filling that spiritual void with a higher power is something faith based rehab programs advocate for. Usually, you will be guided by an alcohol detox counselor or therapist until you get a sponsor in either Alcoholics Anonymous or another 12 step program. There are many different types of recovery programs practiced in treatment centers. They all have one thing common: to help get you sober and keep you sober. Whichever recovery program you choose, just know that admitting your powerlessness in the first place and getting help for your drug or alcohol addiction is a huge step. Choosing a faith based rehab is just one option to getting treatment for your alcohol or drug addiction. A faith based rehab is a treatment center that focuses on healing through spiritual fulfillment. They teach ways to find a higher power that will help you feel whole again, so that relapse isn’t an option. The one common theme that a faith based rehab focuses on is finding relief through a power greater than yourself One thing is for certain– your higher power wants you sober. Many times, alcoholics and drug addicts question the god from their childhood and struggle with the concept of a higher power in recovery. The one thing to lean on is that your higher power is rooting for you to get well and will love you unconditionally. In 12 step programs, it is taught that addicts and alcoholics have lost the power to choose whether or not they’re going to drink and/or use. Finding a higher power is the purpose of the 12 steps of recovery. Faith based rehab programs will base their philosophy on this, and help you find inner happiness every step of the way. The disease of alcoholism centers in the mind. It is classified as Alcohol Use Disorder in the DSM-V and substance use disorder in the DSM-IV. This classification means that addicts and alcoholics are suffering from some form of chemical imbalance. A type of behavioral therapy is needed to improve behavioral health. 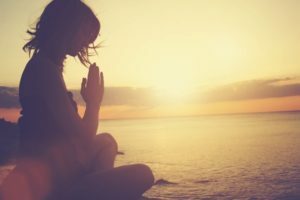 By using faith, or applying a belief in a higher power to your life, it is shown to change negative behavior into positive mental health over time. Faith based rehab centers teach you how to do just that. Most accredited treatment centers will offer a faith based approach as a modality. If you have been struggling with addiction and are feeling hopeless, having just a mustard seed of willingness can only do good in your recovery program. Accept what a faith based rehab has to offer. Learning how to feel contentment in your heart and find true inner peace will help calm any desire for alcohol or drugs you could ever have. Years and years of alcohol and drug abuse causes low self-esteem and poor self-image. Those suffering from substance abuse compromise their religious beliefs in the face of their powerful addiction. There are things in your past you are probably very ashamed of, and you’ve sunk lower than you ever thought you’d go. Don’t beat yourself up too much. These are just things you’ve done–it’s not who you are. Your higher power knows that. Your higher power, should you choose to believe in one, has been guiding you this whole time. And choosing your own spiritual belief system in a spiritual rehab center will enable you to forgive yourself for the horrid things in your past. This type of self-love will enhance your religious beliefs. There is a difference between being religious and being spiritual. A religious person claims their god is the only god, and the only way to heaven or enlightenment. They will follow a group of preordained rules and a traditional set of guidelines and holidays. They will belong to a group of people that believe in the exact same thing. This has a deep meaning for anyone struggling with addiction. Being caught in the toxic cycle of drug abuse and alcoholism creates a personal hell that most people would never want to live through again. They relate to this saying on a cellular level. Drug addicts and alcoholics also struggle if they come into a faith based rehab already having a religious belief system. They feel they have let their god down, or that they will never be forgiven. They think God has abandoned them. The thing is, the god of your understanding, or the god from your childhood, may be different than a finding a higher power that will help you stay sober. If that belief system had worked for you, you wouldn’t need alcohol and drug detox. Old concepts about who and what God is may need to be temporarily abandoned. This will help you change your point of view about drug abuse, your loved ones, and whatever religious beliefs you have. Recovery from drugs and alcohol is all about change. The eyes you’ve been looking at your life through have been clouded and half-open. A faith based rehab can help shift you into having a whole new perspective on life. Alcohol abuse is a terrifying ordeal and causes many kinds of behavioral disorders. Finding hope in spiritual rehabs can sometimes mimic a Christian viewpoint on a higher power. Most 12 step recovery deals with spiritual principals taught in the Bible or in church. Many treatment programs can help you find whatever power you’ve been missing in your life. You don’t need to drastically change your religious beliefs, or adopt new ones if you don’t feel comfortable . The caring and professional staff at New England Recovery and Wellness Center know there are many ways to achieve sobriety. We are here to help guide you on a meaningful path that works for you. Whatever treatment option you choose, overcoming alcohol and drug addiction will turn out to be the most meaningful thing you’ve ever done.